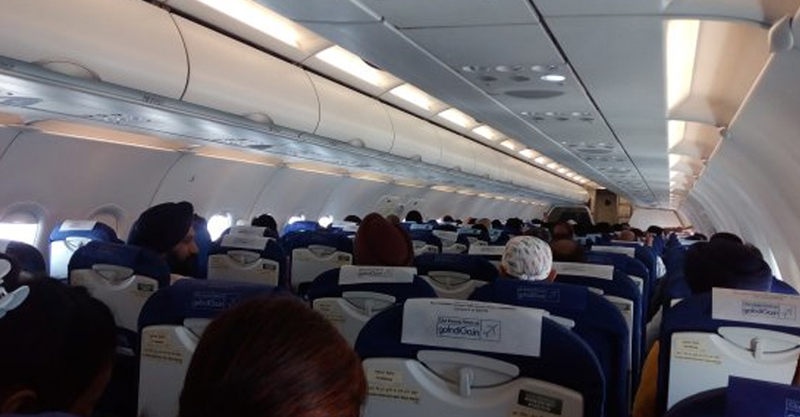 A video going viral captures the moment a man in Madhya Pradesh’s Indore got down on one knee and proposed to his girlfriend on board an IndiGo flight to Goa. The proposal took place minutes before takeoff. He even got a little help from IndiGo’s ground staff who held up signs which read, “Will You Marry Me?” Fortunately for him, it looks like she said “Yes” to his romantic proposal. The video shows the man proposing using the internal announcement system aboard an Indore to Goa flight on May 20. It shows the woman walking up the aisle towards the front of the plane. That’s when the man drops to his knee and offers her a single rose, which she accepts. Around the happy couple, passengers whip out their smartphones and start recording the proposal. The airline staff, in an apparent show of support for the man, grin widely and hold up placards on the aerobridge with the words “Will You Marry Me?” written on them. The romantic gesture, however, maybe in violation of guidelines issued by the Directorate-General of Civil Aviation (DGCA). Indore Airport Director Aryama Sanyal told news agency PTI that the man had first proposed to his girlfriend on the aerobridge connected to the plane. Moments later, after obtaining permission from the airline staff, he used the internal announcement system. Ms Sanyal stressed that the proposal happened before the plane took off and requested that it be seen in a “positive” manner. “If a person is proposing to someone at the aerobridge, then there is no need to take permission from the airport authorities. However, for using the internal announcement of the plane, the nod of the flight’s captain must have been taken,” she said. The Civil Aviation Requirements (CAR), issued in 2010, state that “the public address system and interphone system are tools for relaying safety information”.